Posted 20 October 2010 in Bonus, Cooke Looks, Jimmy Olsen #134. Holy smokes! 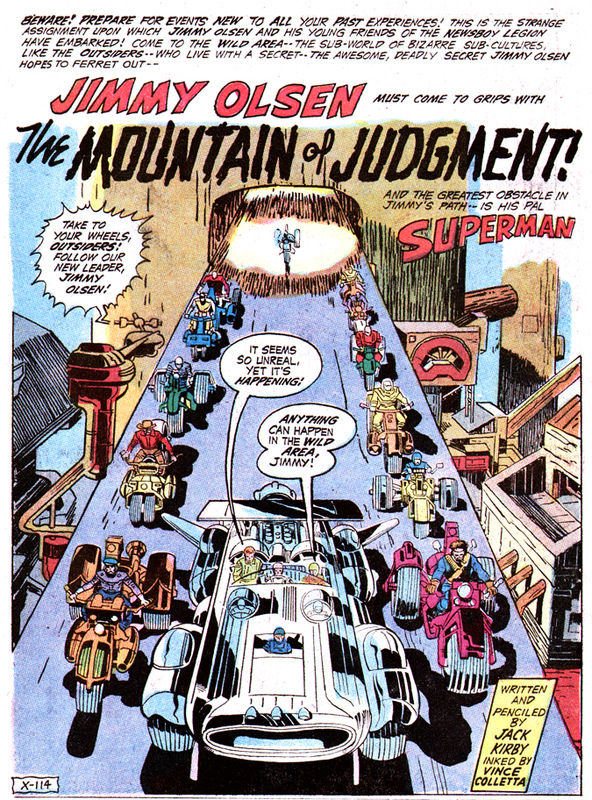 What a helter-skelter ride this ish is, the second comic book in Jack’s Fourth World saga: A breakneck race down the Zoomway by the Whiz Wagon (with Jimmy and the Newsboy Legion onboard) and the Outsiders in search of the gargantuan Mountain of Judgment! 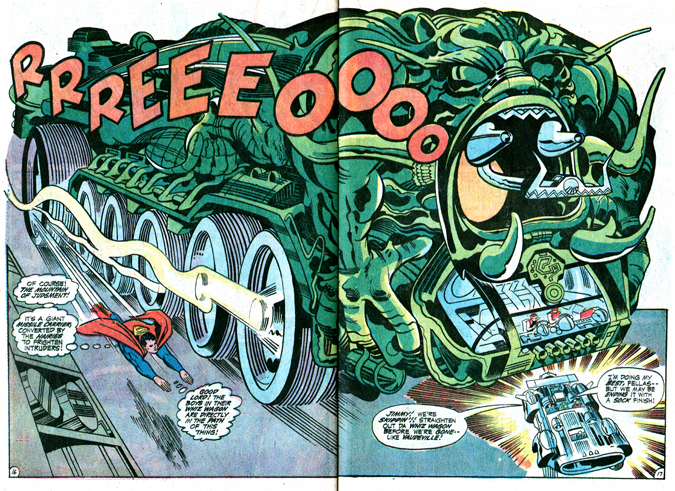 The Big Jump, Flippa’s underwater demolition save, Supes’ last-second rescue of the boys, who were about to become roadkill under the wheels of The Hairies giant ride… phew! Where’s my Valium? 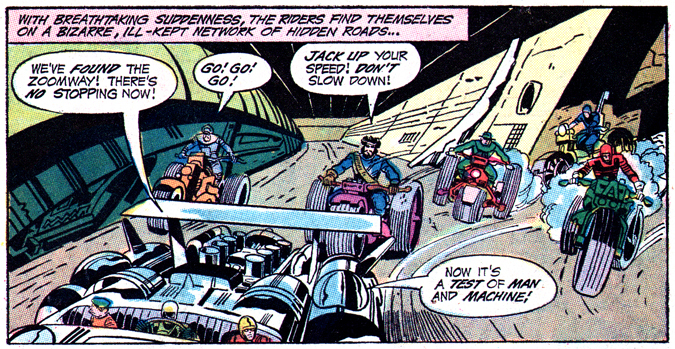 It’s appropriate, I think, that after Jack introduces SO much to us readers in his premiere Fourth World effort, a solid half of his second issue is devoted to a (albeit hair-raising and nonstop) road race… it eases the intellect and stimulates the id, don’tcha think? There’s not much to talk about really, regarding the story overall, but we do feel like we’re going somewhere, on the Zoomway, towards the deeper mysteries of The Wild Area, and into the complexities of the unfolding storyline. We see the natural, outside world of The Outsiders and then glimpse the dark interior environment of The Hairies’ high tech laboratory on wheels. And they both are appealing. Jack’s starting to get at something, a thing I’m just beginning to fathom… a statement about the hopes and dangers that encompass man’s endless quest for answers…? I dunno, but I sense we can forever dig into this material and be amazed at what we might find (or THINK we find!). And, it goes without saying, we are introduced to the Great Villain Himself. I guess the word is resonant. I’m ramblin’, but good ish! On Sale Date: Oct. 20, 1970? 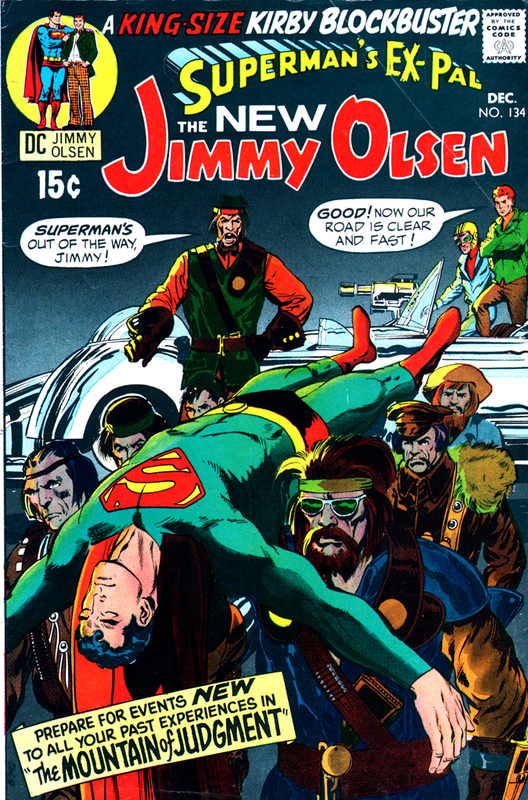 Posted 20 October 2010 in Apokolips, Day Entries, Jimmy Olsen #134, Villains. 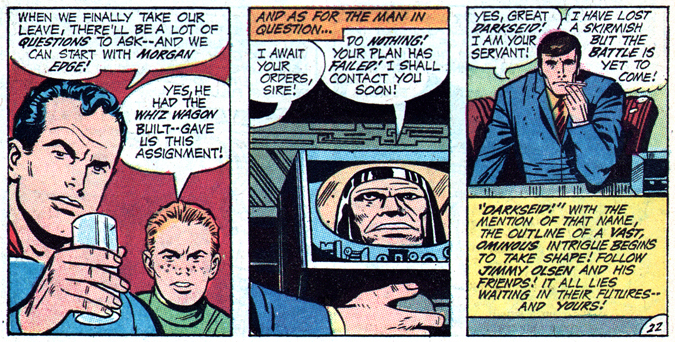 Such a low-key introduction for the most important figure in Jack’s Fourth World mythos, the Master of the Holocaust, leader of Apokolips, the Revelation and all-round Tiger-Force of All Things… ladies and gentlemen, I give you: DARKSEID! 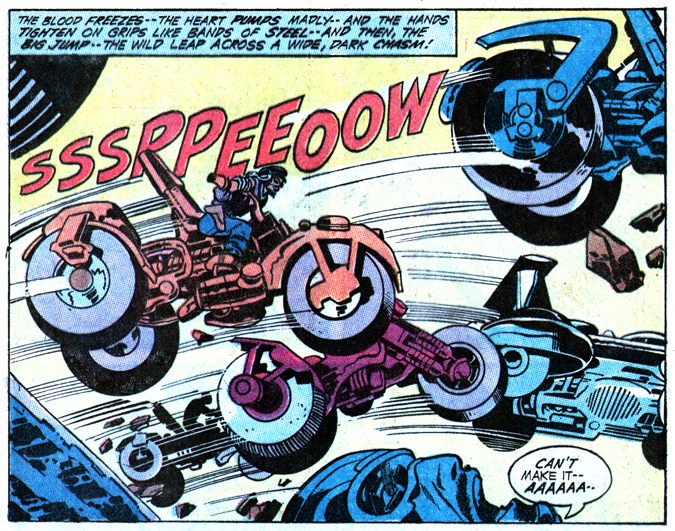 Darkseid just might be the greatest comic-book villain of them all. Galactus is a superb candidate, except there is an ambivalence, a melancholy about that “God” stand-in which allows for a modicum of sympathy. Not so with the ashen-faced, stoic, helmeted nemesis of all that is good… Empathy? Not a chance! But respect? You betchum, Red Ryder! Ol’ Darkseid doesn’t have to scream and stamp his feet (though he’s known to bellow a little at times), he just stands there, cold as stone, and that’s enough to scare the poop out of anyone in his presence. An inspired and resonant creation, created by an artist seeking answers to deeply profound questions — The Meaning of It All — in the pages of that much-maligned art form, the comic book. Who’da thunk it? Posted 19 October 2010 in Day Entries, Earth, Jimmy Olsen #134, Supporting Characters. Are The Hairies, the super-secret young scientific community on wheels, Jack’s take of the hopes he instilled on the iconoclastic and questioning-of-authority hippy culture of the day? Whoever they are, whatever they represent, the roving clan of twenty-something geniuses are a remarkable inclusion into the emerging Fourth World mythos… though I’m not totally convinced Jack himself knew what they were all about. The longhairs drive around the Zoomway, avoiding enemies and scaring Wild Area residents in the monster-like “king-size mobile home,” the Mountain of Judgment, and they use their super-intellects and abilities to develop new devices and concoctions to advance the human race. But isn’t Dubbilex — or his Apokoliptian counterpart, the Four-Armed Terror — aren’t they DNAliens? Hairies are “Step-Ups,” Jack’s designation for the next evolution of man, correct? And, if as Jack’s essay indicates, they are compassionate, giving, connected people, who “fear nothing, hate nothing, worship nothing but their own compatibility with the rest of Creation,” why the heck are they working with a U.S. government complex that’s monkeying with the very essence of life itself, doubtless for the benefit of one nation over all? Isn’t that a huge contradiction? I quibble. The Hairies represent hope dawning for the King, optimism under a persistent threat of nuclear Armageddon. That’s enough for me! I don’t believe that I shall ever get to see a Hairie. Perhaps, that’s as it should be. Perhaps, all that’s owed to a man is hope dawning instead of dreams fulfilled. Somehow, I feel that the question with its ramifications is more exciting than the answer wrapped in organized, practical, well-defined reality. 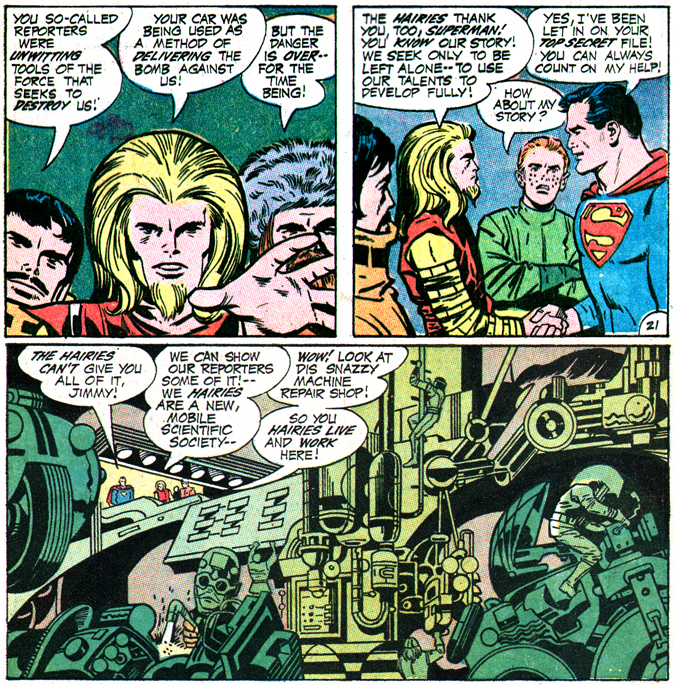 In the “Now,” in the shadow of the atomic silo, when Apokolips and New Genesis race neck and neck for the fate of man, the Hairies are being born. Of course, at this stage they merely represent what stability and rationale still drive us to survive despite the widening seams and traumatic shocks that have rattled the underpinings of the Twentieth Century. They are born differently, raised differently and mature with their own imaginative views and directions. They don’t accept the accepted. They are their own experience, and follow it where it leads them. Their minds are fresh and new, clean slates unmarked by rigid, hardening, conflicting indoctrinations. They cannot be pigeonholed, labeled in the context of all that has gone before. Thus, they fear nothing, hate nothing, worship nothing but their own compatibility with the rest of Creation. That is their challenge — to find a way of living with what is around them without the mindless, merciless prerogative of inflicting destruction. Of course, this makes the Hairies perfect targets for all of us! We’ve got to kill them! Wipe them out! They are not like us. We are pridictable, they are not. We recognize our enemies, they do not. We will kill to protect ourselves, while the Hairies find other effective ways. The Hairies do not view the mysteries and wonders about them as we do. What we conquer, we impose our will upon and violate it for our own needs. Our behavior generates the problems that arise to confront us with equal menace. The Hairies operate with foresight and viability with a pattern without rules or dogma. They wing it with a zest to live and learn and make existence an art form instead of a mad, grim march towards death. They exert no pressures on their fellows. They strive to give each other what they can — and that can be quite a bit, in view of the fact that each Hairie considers the other a most valuable and miraculous organism. Are the Hairies nutty, naive, little idealists? Don’t they know that even we, who are spawned, are too carnivorous to stake our lives on a world filled with other men? Well, that’s something we don’t know! We’ve lived with ideals, but when has man, as a species, disseminated idealism without destruction? When has man tried idealism as a viable, constructive pattern of living? When has “Get yours — and the devil take the hindmost” not been the universal state of things? On a world scale, man does not believe that idealism will work, and thus each division practices its own brand — struggling with it, exporting it and killing for it to protect its individual continuity. The Hairies, by their own nature, do not accept this. They merely live in harmony with whatever and whoever they contact. Idealism is part of their make-up and they react to its shortcomings with intelligence and sobriety. They do not panic. They do not fear death. They expect the unexpected and are ready for it when it comes upon them. To sum it all up, the Hairies are in trouble! The world of man mistrusts and fears those who live by patterns considered foolish and unworkable and clear of conflict. It isn’t natural! It has no strength, no obvious invincibility! The Hairies are weak, treacherous, unpredictable, little bleeding hearts! Someone had better take them in tow and stop them before they become a menace! After all, they’re not like us. Why take a chance onletting them grow larger, expand to the point of colliding with our power? Get them now! Kill the Hairies and kill our fear. It would be easy to do — now! I felt great, writing that! It made me feel that all’s right with the world, that my place in it was secure. It made me feel like a man!!! 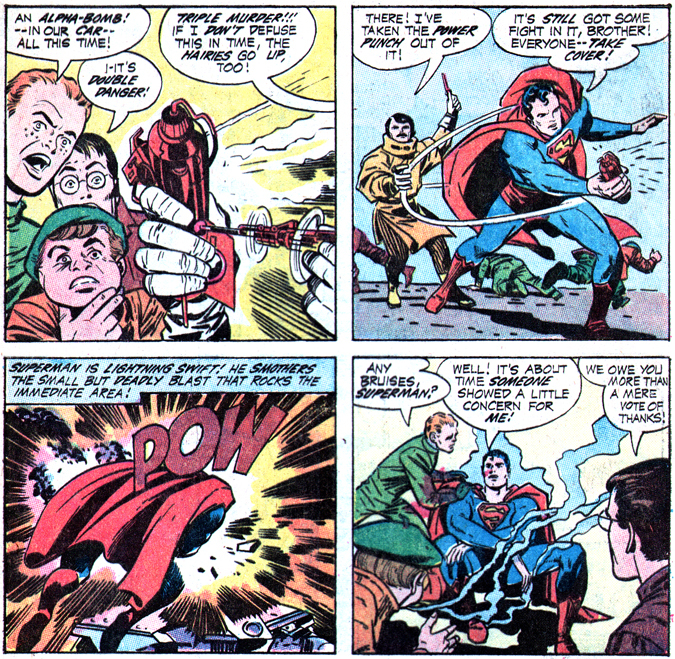 Posted 18 October 2010 in Day Entries, Jimmy Olsen #134, Weapons & Devices. The Hairies use “sensitive indicators” to locate a hidden explosive — an Alpha-Bomb, set to decimate the “new, mobile scientific society,” mayhap an Apokolipian-built weapon of mass destruction? — hidden in the Whiz Wagon. And we begin to sense GBS Morgan “Smiling Cobra” Edge has sent Jimmy and the Newsboy Legion to the Wild Area on a suicide mission as unwitting delivery men of said killer device. 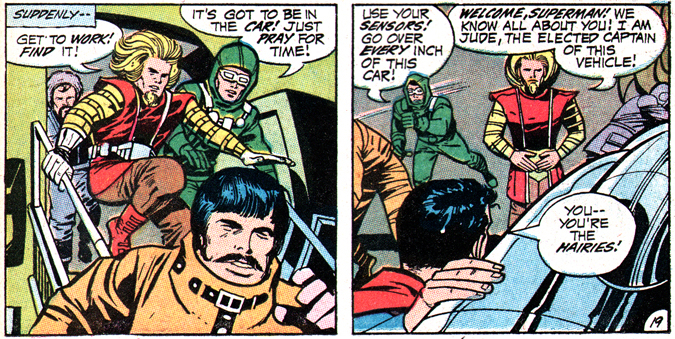 Posted 16 October 2010 in Day Entries, Earth, Jimmy Olsen #134, Supporting Characters. The duly elected captain of the Mountain of Judgment is Jude, looking every bit like a grown-up, twenty-something Kamandi (the Last Boy on Earth) or the moody, angelic Angel from Boys’ Ranch (or, for that matter, a younger version of Thor or Captain Victory!). The blond hippy is part of a new, mobile scientific society known as the Hairies, who constantly ride the Zoomway (“…to avoid our unseen enemies”) in the giant green vehicle, creating splendid new devices to aid mankind.